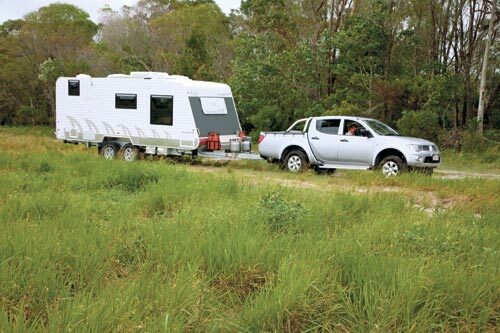 River Caravans is a Victorian-based manufacturer that specialises in rough-road and offroad caravans – everything from luxury vans to pop-tops, and a good selection of family models. 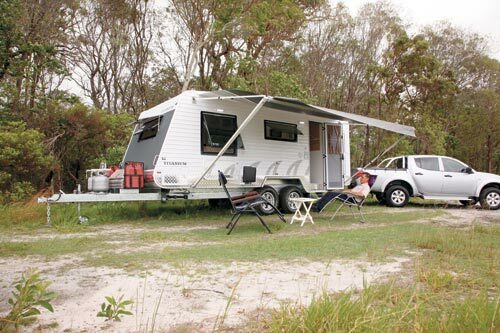 Our review caravan, which came from Caloundra Caravans in Queensland, was the mid-range Titanium. Underpinning the Titanium is a standard hot-dipped-galvanised box section chassis with 150x50mm rails. Forward of the suspension mounts is a double section of rail, which is also part of the drawbar. But, further back, the Simplicity suspension sits on a 50mm riser. Additionally, the extended drawbar has a third ‘leg’ that extends back to the chassis, so there’s certainly no shortage of RHS steel in this van! The drawbar is a busy place, starting with a Hyland 3500 hitch up front. Although similar in style to a conventional ball coupling (it can be used with a 50mm towball), it is designed to give greater articulation, but it must be used with a 3.5t-rated ball. Also on the drawbar are two 9kg gas cylinders, two jerry can holders and an alloy checkerplate toolbox. There isn’t a conventional front boot but, in addition to the toolbox, there is front tunnel storage with access from both sides. There’s a couple of vertical storage bins at the rear nearside between the entry door and the corner of the van and all the storage bins come with LED lighting. No storage space is taken up by the Titanium’s batteries, as they are fitted in specially-mounted frames on the front offside chassis rail. For the bodywork, a timber frame hides under the insulation and aluminium cladding. The aluminium cladding also covers the under-floor area, which is an unusual feature. Like many rough-road vans, this one has a low waist of alloy checkerplate – natural rather than the more trendy satin black. In my opinion, it shows the dust less. A picnic table and entertainment unit are located under the Dometic awning, the latter with a swivel bracket and electrical connections for a flatscreen TV. Tinted acrylic double-glazed windows are fitted throughout the van and there are no surprises for guessing that a Camec security door is also in place! The Titanium’s interior décor is an interesting mix of styles – think contemporary with a bit of an oriental look thrown in. 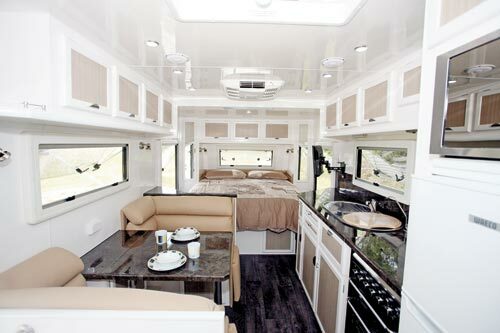 It looks good and gives the familiar front bedroom, rear bathroom layout a bit of a lift. 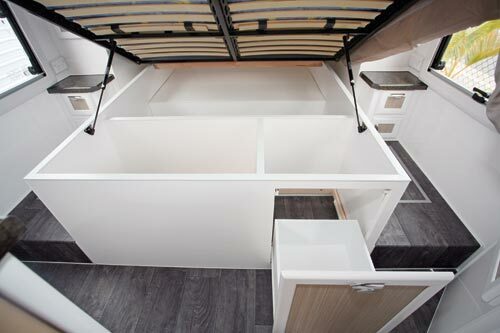 The predominantly glossy white finish creates a bright interior by day and also by night, when there are plenty of LED downlights to illuminate the van. 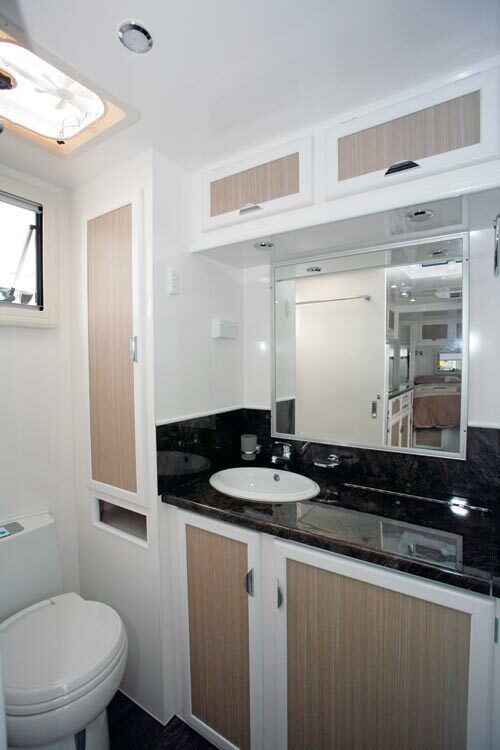 The full-width rear bathroom comes with the full kit: separate shower cubicle, Thetford cassette toilet and a vanity cabinet with a good selection of cupboards and drawers. And one of the cupboards by the washbasin has a top-loading washing machine in it. I liked the little compartment under the cupboard by the loo – it would be good for holding a magazine or two! 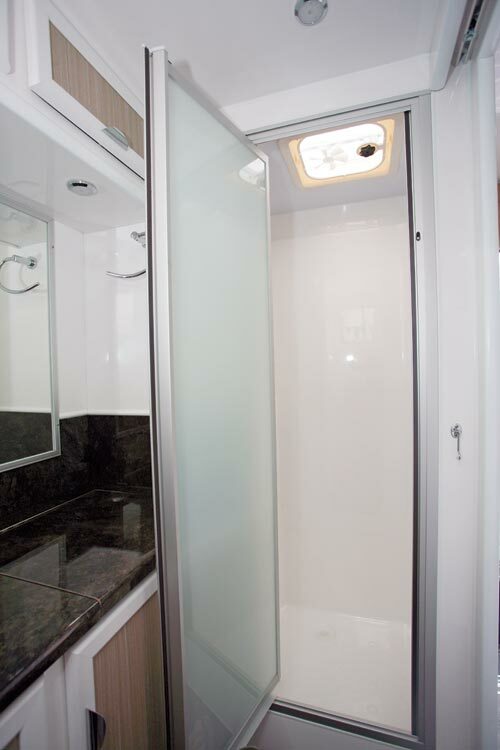 More seriously, this is a well-ventilated bathroom with hatches above both the shower and the toilet, along with a large window above the toilet. There’s a towel rail on the sliding door but I thought a second one would be useful. Filling most of the mid-offside wall is a good-sized kitchen bench. The fridge, with microwave above, butts up against the bathroom wall, which is handy placement for both indoor and alfresco dining. The microwave door has one of those tricky reflective surfaces doubling as a mirror. The locker above contains a number of control switches, as well as 12V fuses and a solar panel regulator. There’s a small surprise in the kitchen, in the form of a slide-out bench, fitted underneath the sink drainer. It can be used on either side and it’s very neat and simple. The kitchen also features a four-burner cooktop/grill/oven alongside a stainless steel sink. That leaves a moderate amount of benchtop space even with the flush cooktop lid up. With a kitchen bench this length, there’s a generous amount of storage space with a selection of cupboards, overhead lockers, and a pantry. However, I think I’d prefer to see one less cupboard and a few more drawers. 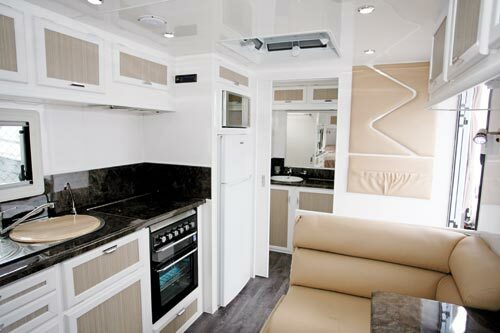 Mounted at the forward end of the kitchen bench, the flatscreen TV can be seen from both the dinette and the bed without difficulty. 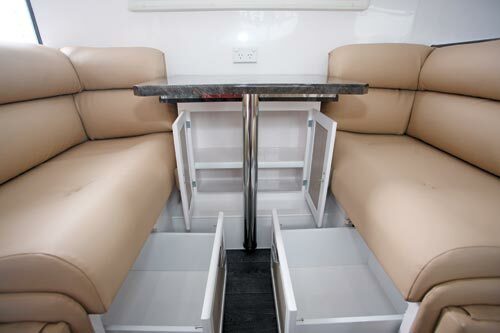 Opposite the kitchen, the café-style dinette has just above everything required for eating and relaxing – two comfortable leather upholstered seats, hinged foot rests, tri-fold table, overhead lockers and under-seat drawers that face inwards. Drawers are slightly less space effective but, in my opinion, considerably easier and more practical to use than under-seat storage that is accessed by lifting seat cushions and ply timber bases. The bedroom, with its 1.83x1.52m (6x5ft) bed and bedhead of wardrobes and overhead lockers is fairly standard. But the floor on either side is raised to create an under-floor storage area. 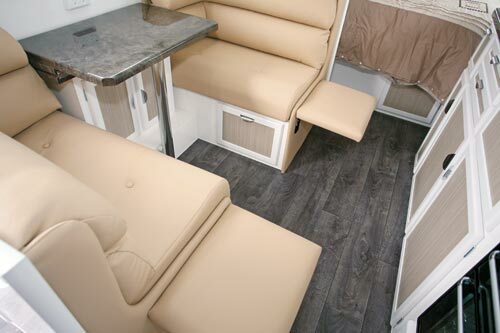 The space under the bed (partially occupied by the front tunnel boot) is also has a drawer, making it suitable for large and small items. With a Tare weight of 2540kg and a load capacity of 400kg, this isn’t a particularly light van but it does have a surprisingly small (relatively speaking) unladen ball weight of 160kg. 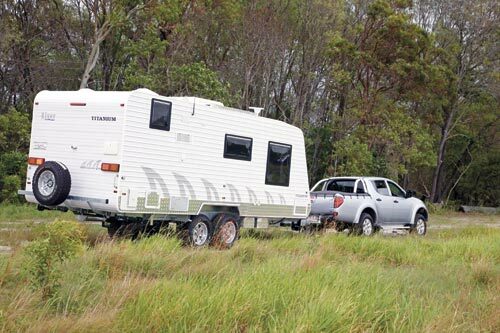 But, even with that, it still requires a medium-to-large tow vehicle. That said, the Titanium does track along quite well, which is something to be considered if you’re planning to hit a few rough bush tracks. The Titanium is quite conventional in layout and build. 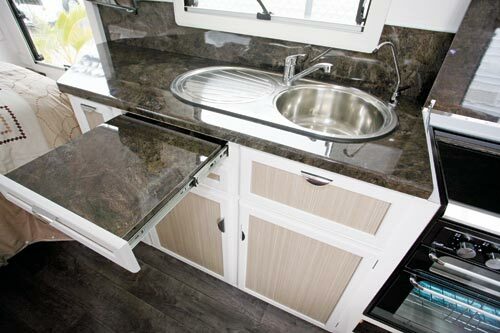 There are a few unique touches, though, such as the slide-out kitchen bench and footrest/drawer combination. All up, given the price, the Titanium appears to be a nice little package for someone contemplating a spot of rough-road travel around Australia. Simplicity suspension looks like it’s been fitted upside down but is, in fact, a very robust and simple independent system. 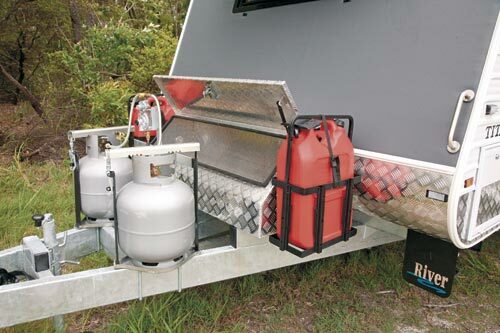 It is very durable and is used on many offroad caravans. 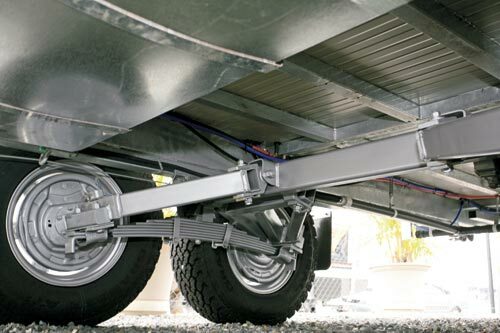 In the case of the River Titanium, the tandem setup has a reverse-mounted leaf-spring and trailing arms, or a leading arm, for each axle. It has a capacity of up to 4400kg. 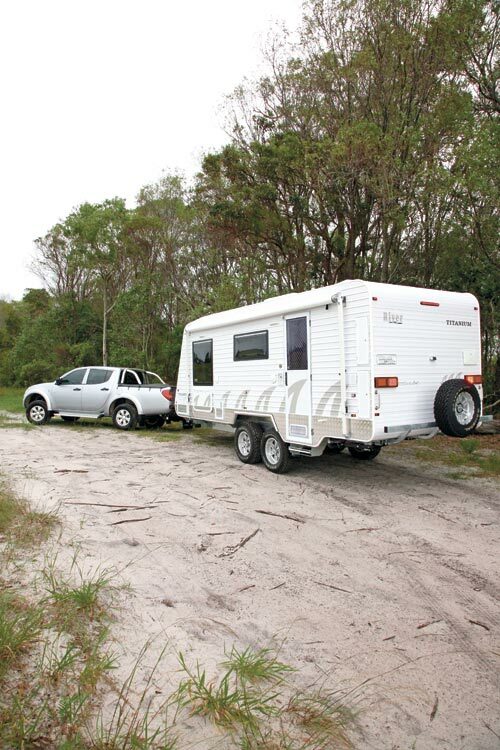 Originally published in Caravan World #517, August/September 2013.